Below is a comment on an earlier post, “If They Ditch the LCS, Perhaps the OPC as Frigate,” but for some reason, it did not show up on the list of comments. I think it is interesting enough to warrant its own post. The Brazilian Navy has an on going project to develop and build the new Tamandaré-class corvettes/light frigates which could resemble the OPC derived frigate on this article. Interestingly Eastern Shipbuilding is one of the companies that answered the Request For Proposals. So they might have a conceptual design for an up-gunned OPC. The general requirements include a 25 kt speed, 3d radar, hull sonar, 76 mm gun, 4 deck-mounted anti-ship missiles, multiple torpedo tubes and VLS for Sea Ceptor/ CAMM AAW missiles (the render seems to point to 24 missiles in 2 x 3-cell ExLS). Quoting from the link, “The Brazilian Navy’s Naval Projects Center developed the corvette basic design project with assistance from Fincantieri’s VARD.” It appears the preliminary design is already done and that it was done with help from VARD, the designer of the Offshore Patrol Cutter (OPC). This Naval Today post from Dec. 2017 reports, “According to the Brazilian Navy’s Ships Projects Center (CPN), the corvettes should be measuring 103 meters in length and displacing up to 2,790 tons.” that is actually a little smaller than the OPC. Delivery of the first of the class of four is expected 2021/22, about the same time as the first OPC. Brazil would like to build the ships within country, but is seeking to partner with another shipbuilder. How about for the NSC? They seem to have arrived at design already. The NSC derived frigate is still contending for the USN FFG(X) contract. We should hear something on decision soon. Reading this article you wonder if the OPC would be able to handle a 8 round MK41vls. @Secundius, I think you have mistaken the Mk57 for the Mk56 VLS. @Secundius, yep MK56, GMVLS, that is the one. It has been put on some pretty small vessels, like the Danish STANFLEX 300, https://en.wikipedia.org/wiki/Flyvefisken-class_patrol_vessel, that are only a little bigger than the Webber class. Apparently the NSCs were designed to accept 12 of these. Now that ESSM is being made with active radar homing, the ship does not even need an illuminator as was required for the previous semi-active homing version. The Mk57 on the other hand is only on the DDG1000 and is about twice as heavy per cell as the Mk41. Mr. Hill thank you for featuring my comment. 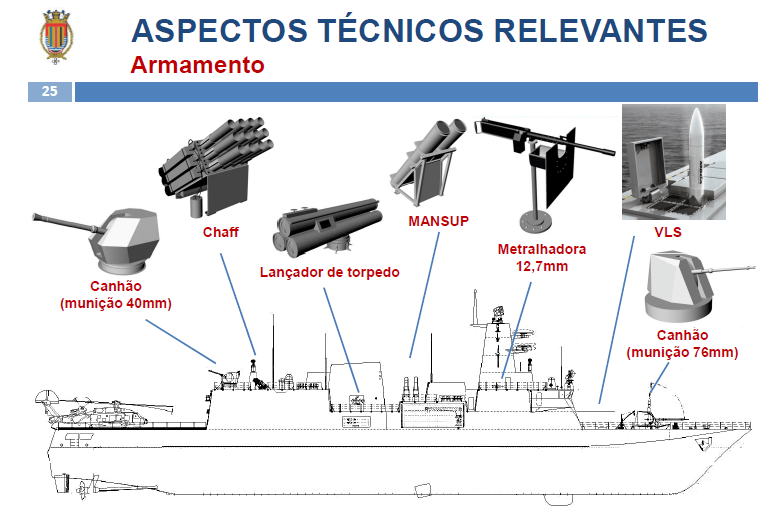 The latest news about this program say that the Brazilian Navy could accept some proven designs other than their conceptual corvette (designed with the aid of VARD as you said). So no hard requirements on displacement or length which opens the door to frigate designs like the MEKO A-200 [also offered by TKMS for the U.S. Navy FFG(X) Frigate Program] or modifications of existing designs (like a lengthened OPC). ROM of firepower of some examples of naval cannon based on the rule of thumb, caliber/shell dia. to power of 3 (cubed/volume) times rate of fire, using the Mk 46 ATK Mk 44 Bushmaster II 30mm as base. The Mk 46 30mm is more of a sniper type cannon, the others are machine gun types, the 40mm is a major step up in firepower from the Mk 46. As firepower capability increases so usually does weight and volume. Need to look at how many rounds are on the mount, and range. @ Secundius, I was addressing that to Nick, but thanks. Actually I am kind of hoping the new icebreakers will have provision for mounting a pair of LCS Mk46 modules, but also a pair of SeaRAM. The 40 mm increased firepower factor drops from 3.6 to 2.8X to that of the Mk 46 30mm, the Bofors 40 advantage lies in the larger volume of the shell and slightly higher rate of fire. I like the 40mm/70 mk4 and would like to see it on the FRC, but it has only 100 rounds on the mount. The Mk46 has 400, but the 40mm is a much better AAW gun and potentially, using the right projectile, much greater penetrating power. Unfortunately the 40mm is not in the USN system, so its not going to be in the USCG system either. The Millennium gun, looks good and was marketed by a US affiliate, but again not in the USN system. Danish Navy and Venezuelan Navy. My Bad! I thought “Raytheon’s” website stated in INCHES, Not Centimeters. You’re not banned. Come back any time. The new BAE Adaptable Deck Launcher (ADL) might be a less intrusive option to add ESSM capability to the OPC. @ Malph: There’s also the Sandia National Laboratories/Lockheed-Martin’s MS2, EMML’s (ElectroMagnetic Missile Launcher). Which “Rail Launches” a ~3.600 lbs Missile to a Height of ~7.3-meters at 40m/sec. Until Missile Booster Ignites. Thanks Chuck. That’s the one. Interesting in that it brings VLS like capabilities in a deck mounted launch.